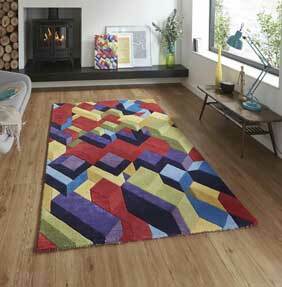 A designer collection of wool and viscose rugs from Think Rugs. This collection features designs from three famous designers, Fiona Howard, Inaluxe and Adam Daily. All rugs are handmade from a mixture of wool and viscose, each collection is woven in 3 sizes. Fiona Howard's collection features light beige backgrounds with subtle multi coloured detailing. The Inaluxe range again features natural / beige backgrounds but the detailing is more bold and eye-catching. Adam Daily showcases a brighter and bolder geometric collection, using deep and bright colours and tones.